Just like people, every dog is different. The breed and the way you raise them are certainly factors, but sometimes their individual personality is the biggest determiner when it comes to the ease of training. You may have been able train one dog without any aides at all but still find yourself scratching your head on getting your next dog to behave. For those more stubborn dogs (or if you simply can’t devote the same amount of time to your new dog), they have dog training collars that can help you. To get you started on the dos and don’ts, must haves and don’t wants we’ve organized a list to start you off right. We reviewed dozens of training collars for dogs to identify the best of the best. We looked at those with remotes and those without, along with those with and without an electric shock. We gathered our research and narrowed it down for you. 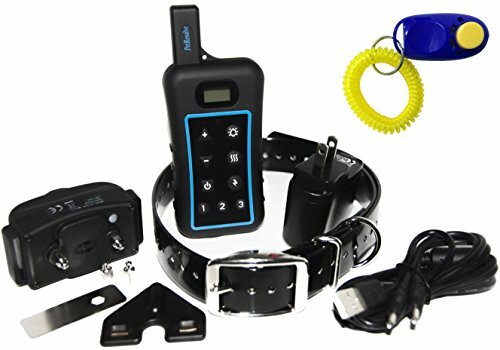 The Best Industries Dog Training Collar with Remote will have your dog leaving his bad behaviors completely behind. Early in our search we could identify the Best Industries Dog Training Collar as a clear winner of our Top Pick honor. With its remote and multiple settings for deterrents, (both shock and vibration), you can see this is a collar designed to be the most effective. Who Should Buy a Dog Training Collar? 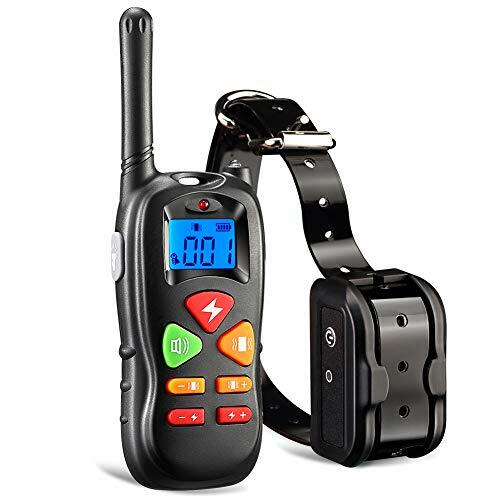 The Best Industries Dog Training Collar with Remote is for any sized dog, so you won’t need to worry about sizing before purchase. You can control whether to emit a vibration or a shock and you can control even beyond that by determining how strong each of those will be. Each range from 1-100 power levels. So you can try a gentle reminder for the first offense and a bit stronger for repetitive behaviors. 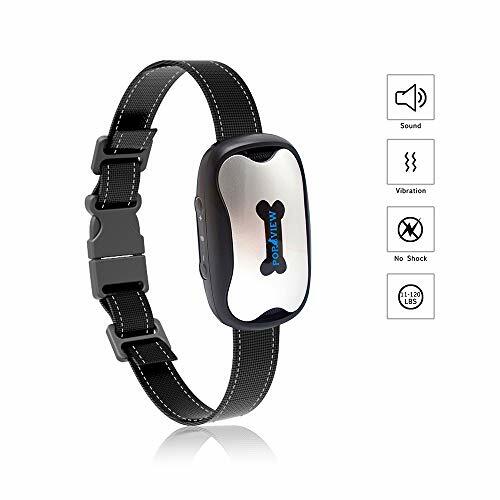 The remote for this collar has a range of 1600 feet, giving you plenty of opportunity to control your pup for virtually as far as you can see him. The battery will only take two to three hours to charge fully and will last upwards of 20 days, making this a pretty low-maintenance collar for you to upkeep. With a rating of 4.5 stars on Amazon, this is a buy you can make with confidence in the quality. And for the $45 price tag, you certainly get your money’s worth. The Ticent Dog Training Collar with Remote Controller has a range of 1000 feet so if you can see your dog, you can probably correct him. It’s so easy to use, it boasts that it’s perfect for first time dog owners, too. And when it comes to training your dog, that’s a huge plus; sometimes training the owner is harder than training the dog. The collar is 100% waterproof, which will come in handy if your pup is a curious one who tends to get into things or simply if he gets caught in a rainfall. The deterrent modes are variable; you can use a shock, vibration or beep to discourage bad behaviors. And within each of those modes, you can control the intensity, as well. With an Amazon rating of 4.7 and nearly 200 customer reviews, this is a safe bet for a training collar that will help train you to train your pup. Get the VINSIC Dog Training Collar with Remote, a collar that will train your dog without ruining your budget. The VINSIC Dog Training Collar with Remote features beep, vibration and shock discouragements and variable levels within each. With this, you’ll be able to control the intensity (with 5 different levels) to create stronger deterrents if your pup requires them and stick to the minimum if your pup just needs an occasional reminder. The 300 mAh high capacity battery will keep you from constantly replacing and will allow you to train your pup without worrying about it dying during a critical training exercise. The range on this collar is nearly 1,000 feet; 300 meters. It’s an appropriate choice for training any dog from 10-100 pounds and puppy to fully-grown dog. The collar is adjustable in length and the unit’s mini-size allows you to use on your dog for extended periods of time without it bothering him. That in itself will go a long way towards training but the ease of use with the remote control will be sure to tip the scales in favor of this collar. With this training collar, you’re only investing just under $35, but you’re getting plenty return for that investment. You can control the level and type of discouragement your dog receives from the e-collar, Pet Resolve Dog Training Collar. Each remote will control up to 3 collars individually (but you’ll need to purchase them separately). The shock on each varies in intensity up to ten levels, allowing you to send softer bursts to smaller dogs and more intense for your more stubborn, linebacker types. The collar can reach up to 3/4 a mile or 1312 yards and nearly 4,000 feet. You won’t have to worry about the range at all. With an Amazon rating of 4.5 and over 500 customer reviews, you know the product you’re getting is a reliable one and with a 2-year warranty, your purchase is protected. 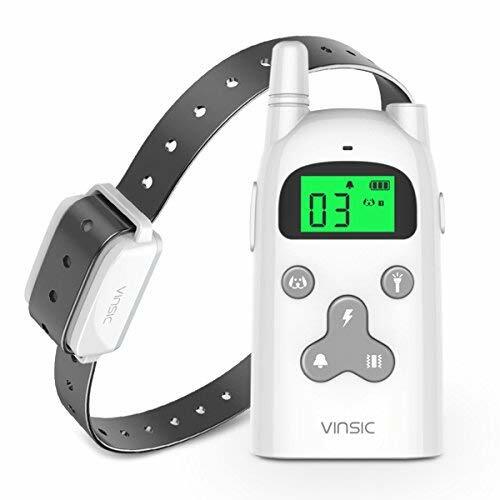 To stop your dogs inappropriately timed barking, pick up the VINSIC Dog Training Collar with Remote. The Pop View Bark Collar is Amazon’s #1 best seller for Cat repellents and training aides, but you’ll definitely see more benefit on your dog. It offers vibration and sound discouragement that will automatically go off when your dog barks. You can adjust the sensitivity to keep the collar from going off when other dogs bark and you can tweak it to deter growling, as well. This collar is ideal for your small or medium dog in need of training, but it may not fit your large dogs, with a collar that extends to 21″ you’ll need to measure to make sure before purchase. You’ll also want to keep in mind your pup’s full grown size if you’re starting on a puppy and adhere to the recommended 6 to 120 pound recommended weight range. There may only be under 50 reviews on Amazon, but they’ve all given an impressive rating of 5.0 stars. And for just $30, it’s definitely worth a look! If you are struggling with teaching your pup right from wrong and what is and is not appropriate behavior, then a training collar may be the solution you need. There are several possibilities for your dog resisting the training you’re trying and as long as he’s healthy and the vet gives him the clear, then you know you just need to adjust and adapt your method of training to better suit him and his personality. You may just be using the wrong reward, you may be too inconsistent or your dog my just be incredibly stubborn. If you’ve tried it all, it may be time to try a training collar. But the dog training collar isn’t JUST for the stubborn, hard-to-train dogs. A dog training collar is a valid first choice, too. Whether you’re not sure how else to train your pup, are training an older dog, or you just don’t have the time to train him any other way, a dog training collar, if used properly, can be your dog’s saving grace. Scent. There are several scents that are displeasing to your dog and emitting those smells into the air near his face will go a long way to deterring him from bad behaviors. The smells are typically citronella or mint so keep in mind that if you’re also not a fan, the smell may just bother you a bit, too. This isn’t the most common collar and it can be hard to find, but if your dog is particularly sensitive to smells, this may be the best bet for you. Vibration. The vibration of an alert will deter your dog similarly to a shock and the more flush with skin the less pleasant it is for them. It doesn’t hurt, but imagine your phone on vibrate suddenly going off while attached to your neck; not exactly pleasant, is it? Combined with your verbal cues of “No!” or “Bad!” your dog will certainly get the hint. Shock. Before discarding the idea of a “shock” or “e-collar” right away, please note that these collars aren’t what they used to be. The light shock is not a painful one, just a low enough jolt to surprise and be unpleasant. This is usually the most effective but this is also the one with the most controversy so even knowing it isn’t really hurting your dog, you may opt away from this type. Loud sound/ultra sonic. This deterrent will set off a loud sound or an ultra sonic tone that will surprise your dog when he’s caught being a bad dog. If reviews are to be believed, this is the least effective of the most commonly used deterrents but it’s also the nicest, so if you’re feeling guilty this may be your solution. Often a beep is combined with another type of deterrent and that seems to be more effective, though. Remote and range. If you’re going to manually control the training collar, keep in mind both the range and your ability to time the deterrent well. If you don’t hit that button and issue a negative consequence immediately after seeing poor behavior, then your dog won’t associate the bad with the behavior. If you have a large yard, make sure your remote can reach as far as he can, otherwise your helicopter parenting him to monitor his behavior will go without result. Waterproof. There are varying degrees of waterproof and you may opt not to get the 100% water proof version but we highly recommend having some water resistance for a dog training collar. There are simply too many actions dogs commonly take that accidentally get water on them. They could run in the rain before you get them in or they could splash through a mud puddle. Just the act of drinking their water could slop water up onto their collar without any real surprise to a pet parent. Take some precautions to prevent ruining the collar you choose. What is a dog training collar and how does it work? A dog training collar is any collar that is designed to discourage bad behaviors. The collar will emit some sort of negative stimulus in response to your dog’s actions. Either it detect the behavior itself (like a bark collar) or it will have a remote that will allow you to set off the stimulus when the bad behavior occurs. The oldest form is a “shock” collar, but a lot has changed since then; they’re no longer painful and inhumane; even the Humane society supports its use (for modern collars, that is). There are other forms of stimulus that will deter dogs, too, though. You can try a collar that spurts an unpleasant smell (usually citronella as dog’s don’t care for that) when your dog is misbehaving. Other stimuli include loud sounds, ultra-sonic sounds, lights, and vibrations. “Shock” or “E-Collars” will often use what they term “Static Correction” for the stimulation. It is essentially the same as emitting a static shock through the collar. It’s a light tingling sensation that won’t harm your dog but will allow him to associate bad behavior with the negative effect. Yes – with a warning. Most bark collars respond to a bark with a negative stimulus: citronella spray, ultrasonic sound, or a brief shock. The problem, and the warning, is for homes with multiple dogs or even dogs nearby. For this reason, many bark collars come with adjustable levels of sensitivity, making it harder to set off or easier, depending on your specific situation. You don’t want your dog getting negative reinforcement when another dog is misbehaving; of course because it’s cruel but also because it will confuse him and make the collar worthless. So use these collars carefully and never when he’s in the company of other untrained dogs. When you’re placing your dog’s training collar, you’ll want to adhere to that collar’s specific instructions. However, they typical recommend the collar be placed high on the dog’s neck, near the base of the skull. It’s the most narrow here and that means it’s less likely to lose contact with your dog’s skin. If you place it too low then your dog may work the collar up just enough to lose that contact with him, making the vibration or shock no longer effective. And don’t forget while placing the collar on, adjust the tightness so you can only fit a finger or two at most between the collar and your dog. Keeping it snug enough is fundamental to making sure it works. And remember that the prongs go on the back of the neck. The static shocks emitted from these collars may not be dangerous anymore but putting them on the throat is still a no-no. This is a training collar that uses vibration, sound, and shock- or not; it’s entirely up to you how you train your dog. You choose which form of discouragement you want to use on your pup, or let their responses determine which is most effective. This collar will adjust from 3.7″ to 22.3″ and is recommended for a dog between 10-100 pounds. This collar is rechargeable but you won’t need to do it often; the remote lasts up to 60 days on a full charge and the receiver lasts up to 15 days. This dog training collar comes with a remote that allows you to control deterrents up to 3/4 a mile away and to sweeten the deal, it comes with a collapsible food or water dish. With a 2,600 ft range (or a half mile!) for this remote, you can really let your dog enjoy a run while still making sure he behaves appropriately. Each deterrent has its own button on this remote making it easy to do as you want immediately after a bad behavior; no need to switch between modes and miss the teaching opportunity. You can control the intensity of shock and vibration (from 1-100) and also light and beeping for deterrents with this waterproof and rechargeable collar. This collar comes with 2 sets of unit electrodes for the necks of smaller dogs or the necks of larger to make sure you’re using the right equipment for the right dog. This collar was made with your bigger dog in mind, up to 140 pounds and it will give him a bit further to run with a 1100 yard (or 3300 feet) remote range. With shock, vibration, and beeping modes, you chose how to train your dog based entirely on your (and your dog’s) preferences. With the extra large and easy to read LCD screen on this remote, you can control the 1-100 levels of intensity on the static stimulation and vibration with ease. You can get this remote controlled training collar in black or camo and, with purchase of additional collars, you can control three dogs with one remote. You control how intensely the vibration or static shock is felt with variable modes of 1-99. This no-shock training collar includes a free gift of a LED light tag for your dog’s new collar. With a rating of 4.4 and nearly 200 customer reviews, it’s easy to see why this humane collar is Amazon’s choice for bark collar. This collar uses 7 levels of sensitivity that you can tweak to catch and alarm when you want and not when you don’t; so your dog won’t get a vibration when the neighbor’s dog barks. This collar will automatically sound and vibrate as your dog barks, letting him know that it is not acceptable behavior. You choose whether the deterrent your dog faces for bad behavior: ultrasonic vibration or sound. This no-shock collar has thee alternative modes: tone/sound, vibration (with 1-16 levels of intensity) and light flashing.